Answer: For those not familiar with the ROYGBIV mnemonic, let me first explain that it stands for: Red, Orange, Yellow, Green, Blue, Indigo, Violet. 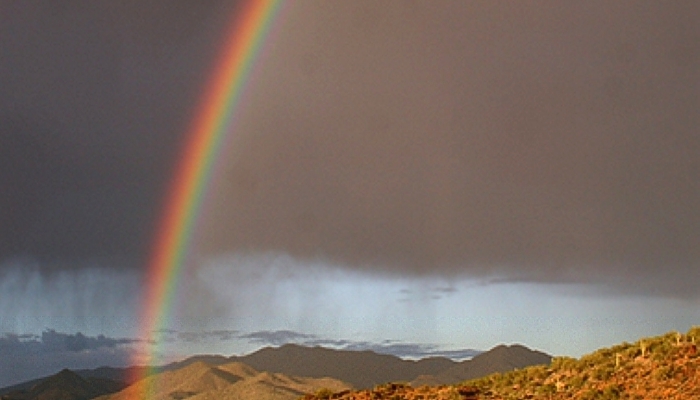 Those are the colors you see (from outside in) on a normal primary rainbow. On a secondary rainbow, sometime called a double rainbow, that order is reversed. To get a full spectrum you need unfiltered “white” light from the Sun, which is a mix of all visible colors. But when the Sun is low in the sky, like at sunset or sunrise, the shorter wavelength colors (violet through green) can get filtered out by the atmosphere. See my July 1, 2011 post for why that happens. 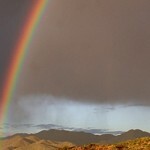 The photo you sent me was too low-contrast to use, but I had a nice red rainbow photo from last monsoon season. It’s the top image I used for this post. You’ll notice that, in addition to the red color, just a hint of greenish-orange is also visible. Some people call that color “gold” but if you sample it with an eyedropper tool in a graphics app, you’ll see it contains more R than G or B. RGB measures the “Red Green Blue” components of a digital image. 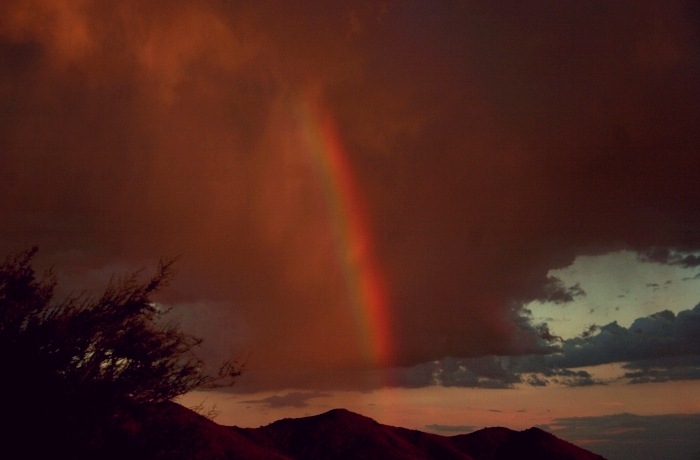 So it’s not a “pure” red rainbow, but it’s pretty close. The Sun was just setting when I shot that photo, so almost all the other colors were absent. Red rainbows (sometimes simply called “redbows”) aren’t really all that rare, but a lot of people miss them since, unless you have a dark background, the color tends to get washed out. If you’d like to see a few more redbow photos taken by experts in atmospheric optics, check out this excellent website.